Many workplaces are festooned with "slogan posters," and sometimes they do have a positive effect. But sometimes they're unhelpful — even destructive. One slogan that can be especially inappropriate in problem-solving organizations is "Do It Right the First Time." It has an equally inappropriate cousin: "If you don't have time to do it right, how will you get time to do it again?" 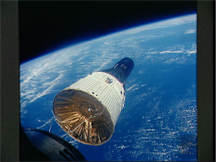 Gemini 7 as seen from Gemini 6 during the first-ever docking of two orbiting spacecraft. The Gemini Program was a preliminary to moon exploration, but none of the Gemini vehicles were capable of completing a trip there. The program's purpose was purely experimental. The pilot of Gemini 7, by the way, was James Lovell, who later commanded Apollo XIII, the mission that nearly failed due to an on-board explosion. Photo courtesy U.S. National Aeronautics and Space Administration. These slogans might make some sense in the operational context, where tasks are very repeatable. But problem-solving tasks are different. Problem solving, which occurs most often in the project context, entails doing something new here, in our organization, if not the world. Here are three advantages of organizational cultures that grant permission to experiment — to "do it wrong" the first time. We often learn more by doing it wrong than by doing right. A series of well-designed experiments that focus on specific learning goals can usually advance the project faster than consistently trying to implement deliverable solutions. When we require that every effort produce deliverable results, we create a culture that's averse to taking the kind of risks that are often necessary to complete projects successfully. When we can accept that a particular implementation isn't "final," and won't ever be, we can take steps to limit our investment in that implementation. We can work on answering only the question at hand. than by doing rightyou decide that experimental approaches are sometimes justified, there are three traps awaiting many organizations. Leaders and managers accustomed to operationally oriented organizations often see exploratory failures as worthless indulgences, because they don't directly produce the desired result. Many with strictly operational experience must learn new ways when they manage problem-solving organizations. Problem solving organizations can be embedded within operationally oriented organizations. For instance, most IT organizations are responsible for information and computation operations. Managing them requires an operational orientation. But these same IT organizations also contain groups that develop new products and first-of-kind services. Managing these efforts requires a more experimental approach. And this is a problem for slogan posters, because everyone sees them, and some slogans aren't right for everybody. Some organizations have a historically operational orientation, but now perform most of their work in the project context. In some cases, the old culture hasn't yet adapted to the new work. Would you like to see your comments posted here? rbrenLVocsNdOKNeqrKliner@ChacumQqQaxbonRCRbtIoCanyon.comSend me your comments by email, or by Web form. I offer email and telephone coaching at both corporate and individual rates. Contact Rick for details at rbrenZydQhiVnoFktgNinner@ChacWzxBeBAITVnXapcwoCanyon.com or (650) 787-6475, or toll-free in the continental US at (866) 378-5470.